Let's be clear: 'alternative lifestyles,' for Fox News pundits, is code for gay. 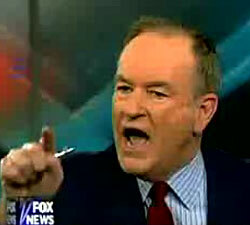 O'Reilly is concerned that watching Glee will turn your kids gay. O'Reilly didn't say gay though, because for conservatives your sexual orientation is not something that's fixed or innate, like your eye color or the color of your skin - instead it's altogether more elective, it's something you can fall into, like stamp collecting or model ship building. Which means that all it will take is for some bright on the surface but unbridled underneath prime-time award winning song and dance show to throw you and your sexuality into a tailspin. This means of course that no one at Fox News has ever watched the show. Why bother when it's more fun to ring the alarm bells? Glee is a sweet, often overly saccharine, rendering of the many trials and tribulations known to teenagers: bullying, ostracization, peer-pressure, first love, you name it, it's all here. What Glee is not, it should be pointed out, is a kind of sexual atlas to the further shores of decadence, which O'Reilly is clearly implying. O'Reilly's latest freakout illustrates an important conservative principle: to acknowledge reality is to surrender to it. To think of a thing is the gateway drug to doing the thing. If you give gay people equality you are giving your husband or wife permission to become gay, under this rubric. To acknowledge a thing is to surrender to it. Once you open the door the gay floodgates will be unstoppable. That's the 'attack' that we must 'protect marriage' from. Young people 'might go out and experiment with this stuff,' O'Reilly moaned, apparently unable to tell the difference between thinking and doing. And there it is again, your sexuality is simply a lifestyle, it's like stamp collecting, and you might decide, having being exposed to exciting new alternatives, that really you'd be much better off getting into embroidery or quilt making. It's too stupid for words, but nothing's too stupid for Fox News.